ActionCOACH’s annual franchise conference was the usual mix of great speakers, friendly sporting competition and recognition of the numerous successes of the network which now exceeds 150 franchise owners. The two-day event kicked off with guest speaker Tosin Ogunnusi, a motivational training and performance improvement specialist. Tosin is a professional fire-walking, board breaking, bar bending, and glass-walking instructor and trainer, hypnotherapist, and trainer of neuro-linguistic programming. He wanted to talk about ways to improve the power and delivery of presentations and he certainly did that! John McCarthy, a franchise owner since 2014, explained, “His stage presence was incredible and his delivery was outstanding. Rarely do you experience someone who is such a powerful and authentic presenter, who can ensure the whole audience engage and gain such benefit from their presentation.” Easy to see why Tosin won The Professional Speakers Academy Award for 2016 Trainer of the Year. Franchise owners weren’t the only winners at this year’s conference, Jeff Shrimpton’s UK team won the touch rugby tournament on the last day of the Global Conference in August this year, with his charity of choice receiving a cheque for £1,000 at the UK conference. 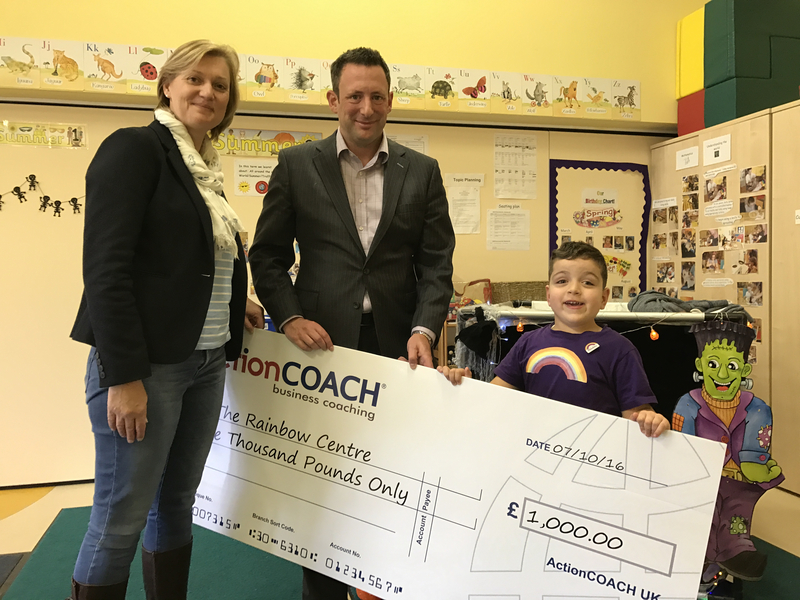 Jeff chose a charity local to him in Hampshire, The Rainbow Centre, who inspire and support children and adults with neurological conditions like Cerebral Palsy and MS to become active and reach their full potential. The conference ended with ActionCOACH’s own version of the Ryder Cup with golfers split into teams representing either the north or south of the UK. Team South prevailed as the last team entered the 19th hole just as the sun set on a great two days of learning and camaraderie.